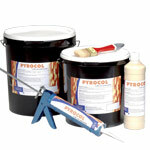 PYROCOL are simple pasting water-based glues which provide an entirely non-combustible film. PYROCOL film, slightly intumescent, enhances the fire resistance of elements to which it is applied. Its initial setting time, lower than that of traditional glues, allows earlier handling of glued elements. Examples of applications for non-combustible glues PYROCOL A, E, L & F: bonding of polyurethane, mineral wool, glass wool, ceramic and SUPERWOOL fibres, calcium silicate boards, plasterboards onto a wide range of receiving surfaces.